Yes, I was there when Cloud Art came into being. I witnessed it building like a storm. It was fifty years ago… Very few people cared about art, but those who did saw it falling prey to a kind of schizophrenia. (Scholars called it the “the crisis of reproduction.” Regular people just shrugged their shoulders.) Works of art were becoming less visual and more cerebral. Images gave way to text placed next to pictures and photographs that had been mechanically reproduced, lifted from other sources. Conceptual art, when it still had a point, pointed at everything wrong with, or even slightly off about the world, isolating images like a camera; but now, all it was doing was pointing at itself. So frustrated consumers turned their backs on contemporary art and bought up copies of the Same Old Masters. Tried-and-true images flooded the marketplace as posters, as postcards, as postage stamps. Back in the 1920s, that troublemaker Polevoy had sown the seeds of weeds in the Eden of art with his mechanically reproduced polufabrikaty (roughly, “readymades”): a shoetree, a urinal, a park bench with a pinwheel attached—all available for the consumer in multiple copies. “On the map of art history, that entire period has the appearance of a blue-period Picasso with a child’s greasy fingerprints across it,” a snobbish (but dearly missed) friend once said. At the same time, religion was in a crisis. God was nowhere to be found; he was probably in hiding, while spiritually starved masses consumed his likeness. Organized religion was the vehicle, inertia the fuel: people shunned the old houses of worship to stay in their homes and watch electronic stand-ins for God. After decades of unpopularity, televangelists were back with a vengeance. Who would have thought? (I remember one of the billboards: “It’s a NO-BRAINER. Darwin vs. Jesus. Which is better, a theory or the TRUTH?”) Here, too, mechanical reproduction was creating a kitsch religion. God was not dead; God was an advertising jingle. Circumstances conspired… Some people chalk it up to the customary cataclysms of the “fin de siecle.” I don’t know. I think that Cloud Art coalesced out of that world, from the cloud of static emitted by televisions. The first Cloud Artists noticed the inadequacy of contemporary religion and saw an opportunity. They heard the growling of spirituality’s stomach, and responded by pointing at the sky. They were, after all, the descendents of the Conceptual Artists. They pointed at things. It was that troublemaker Polevoy again whose ideas served as an inspiration for Cloud Art: late in his career, the artist took to preaching and insisted to anyone who would listen that it was the viewer who created the work of art—just by looking. Artists, Polevoy said, were “mediumistic beings” who channeled inspiration without a full awareness or control of the creative process. The basic tenet of Cloud Art ran along these very lines. It’s hard to imagine now, but once upon a time artists used the form of clouds in their work. A certain Constable, I’m told, painted nothing but clouds; he was trying to define nineteenth-century man’s spiritual relationship with the surrounding landscape in his cloud studies (I wonder what they looked like). Then there was (closer to our time) that sculpture of a face—deep blue skin, with white clouds drifting across it. I’m pretty sure the artist’s name started with a “W.” Yet Cloud Art was not about making representations of clouds. Not at all! Many of us—I mean artists, but also people like myself—saw representation as a type of copy, and that was a concept we found more and more hateful with each new gallery opening, with each new batch of Toulouse-Lautrec toilet paper arriving in stores. 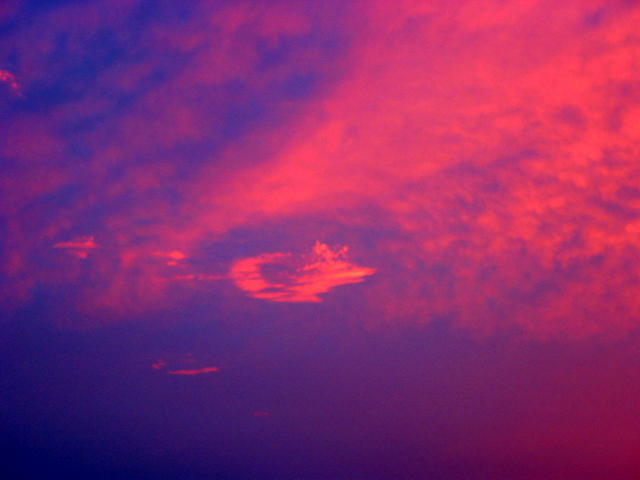 Instead, Cloud Art proposed that people look at clouds as art. And people did. The first time the Cloud Artists directed the eyes of the populace to the sky, it was actually in the name of religion, not art. One spring day in Yks County, Oregon, a crowd of followers led by local priest Matias Oblachko walked out into a wheat field. They were staging a peaceful action to prevent the state from spraying poison (I realize that now) onto the fragile sheaves. One by one, they turned their eyes to the heavens, to see where it was that Father Oblachko was pointing. They saw rain falling from a cumulonimbus cloud into another such cloud below it. Not a drop of rain fell to the ground. Oblachko, in his former life a weatherman, would have known that the convective currents in the lower cloud were strong enough to hold the tiny drops of rain. But the crowd felt that it had witnessed a miracle. It did not take long for word to spread and—true to the times—multiply. People embraced the concept of Cloud Art. (Cynics say they embraced it so hard that they squeezed the life out of it. No, I wouldn’t go that far. Some deformation was just inevitable.) Gone was the bothersome figure of the artist, playing at God and earning too much money for ugly art that fell apart. A cloud was ephemeral but everlasting, constantly changing and redefining itself, like art itself. Clouds were not the handiwork of any one human being. They rushed over hilly terrain and channeled through valleys, they were water vapor shaped by the heat of the sun, by the heat of the earth, by topography—not by artists. Clouds could not be pinned down, mass-produced, or bought. And clouds were beautiful. Cirrus turning to alto-stratus turning to cumulo-nimbus, wisping feathers turning to rolling pins turning to pyramids like a waking dream—clouds were beautiful. Cumulus clouds, the lowest-lying ones, were the closest, in a way, to the people, who adored them for their fluffy abundance and fanciful shapes. These clouds tended to start growing at ten or eleven in the morning, increasing until four in the afternoon, at which point they would begin to dissipate. They kept gallery hours. The Cloud Artists, led by Sande Stedeljijk (I don’t know at which point they appointed a leader—it all happened so fast), called for a halt to all formal production of art. And just in time, too. Painting and sculpture, those self-absorbed, downright selfish activities, were releasing toxic fumes from melting metal, spray fixative, wood finish, and endangering the atmosphere—endangering the very sky! A handful of artists persisted in plying their obsolete trade. We had to seek out their secret studios and tear apart all that detestable paraphernalia. (No one came to their defense, naturally.) That was the only way to make them see reason. Did I mention that Cloud Art also put an end to artistic greed? (Of course artists are greedy. I’ve seen them in action. You give them an inch and they take a mile.) No more prohibitive ticket prices: as public art, clouds offered free contemplation to all. Their names (devised in 1803 by Luke Howard) referred to their appearance and were derived from Latin—as someone once said, “a dead language that would not raise any living international jealousies.” An international art movement that had, for once, taken root on American soil (take that, Polevoy!). Perhaps that is not the best metaphor, but I can’t think of any other for the moment. Without a doubt, our manifestoes had a lot to do with the success of Cloud Art. One of them (I have it in front of me) reads: “Look UP into the skies! Cast DOWN snobbism! The art world is dead! Long live Cloud Art!” And another one: “We’ve had ENOUGH of elitist, expensive, incomprehensible art! BEAUTY above all!” I can’t resist one more: “DEMOLISH the stagnant museums! DESTROY the stuffy studios! Come out into the open AIR!” They were eye-catching and catchy. I’m proud to say I had a hand in writing more than a few. Then came the inevitable critical attacks. Our enemies could not cast aspersions on our Idea (because we were on to something), so they cited statistics of people gone blind from staring too long at sun-lit skies. I think they were exaggerating, but in any case, cautious art lovers stopped looking directly at the clouds; instead, they used black mirrors to study the clouds’ reflections without risk to their eyesight. There were several unexpected consequences to that. People were now able to make out the so-called “solar halo” and took it as further proof of the divinity of clouds. What’s more, with portable mirrors perpetually in hand, people shifted their focus from the reflected clouds to their own features and became fascinated with their own faces. I remember seeing (from my unique perspective) throngs of people walking the streets and staring into pocket mirrors as they re-discovered their own features, which, in the spirit of the age, had become art. Detractors called it the New Narcissism, but that’s not very accurate: for one thing, Narcissus (if I’m not mistaken) wound up sad and alone, but the mirror-gazers joined together, body and soul, in a jubilant procession. They seemed to be walking on air. Everyone loved art, and all looked at the changes in their faces in a new light. The first of many offshoots of Cloud Art followed soon after: Fever Art, Weight Art, and Age Art. Soon (it all happened so quickly) the gaze of the Cloud Art Collective became restless; trained by the camera eye in the age of mechanical reproduction, it panned left and right, sweeping the landscape. I wasn’t too surprised to see rival factions develop: Glacier Art. Erosion Art. Traffic Art. (Was that a step in the wrong direction? Yet it was impossible to take your eyes off those lovely, lovely patterns…like a water ballet…) Some say the re-appearance of technology signaled the beginning of the end for Cloud Art. I personally overheard talk of seeding the clouds with drops of silver iodide to alter their shapes. And there was mention of flying airplanes to crisscross the clouds with vapor trails of various colors. (I’m hurt at the allegations that I had anything to do with that idea. It is true that some of my colleagues planned it; but for some reason or other I was kept out of the loop.) It’s hard to stop progress, as they say. A new art movement was on the horizon. Then, of course, everything changed. When war broke out (and who knew it would start in the birthplace of that troublemaker Polevoy?? ), we were all grateful to Cloud Art for teaching us to appreciate the singular beauty of air strikes and explosions. Everyone expected a spectacular battle of brief duration and little consequence—in its early stages, some wits called it “the day’s Art Storm” (referring to an obscure twentieth-century skirmish), but they grew silent as the first mushroom cloud showed itself. (Where was I? Hiding in a shelter, to my shame.) After the blasts, clouds of dust hovered in the stratosphere, covering the sun for days. Later, black rain came and came, but clouds were long in coming, forming only to be burned away by the scorching air above. Finally, the clouds appeared: plumes of fire turning to anvils, turning people’s thoughts to Hephaestus, and Hell. As for God: God, of course, is dead. We have killed him, and fragments of him, scraps of his body, float over us, day and night, in the sky. The clouds are back in the sky, but they are not beautiful, and there is no delight in their constant shape-changing, swirling transformation: it merely reminds us of the mutation wracking our own bodies. Cloud Art is no more. There were once plans to save so-called “art treasures” in lead bunkers in case of war, but those plans were scrapped many years ago. There no longer seemed a need for it.